There are few things more iconic about the Prisoner of Azkaban than the Monster Book of Monsters. I love the scenes in the book featuring this magical textbook and I knew that it would make the perfect valentine. 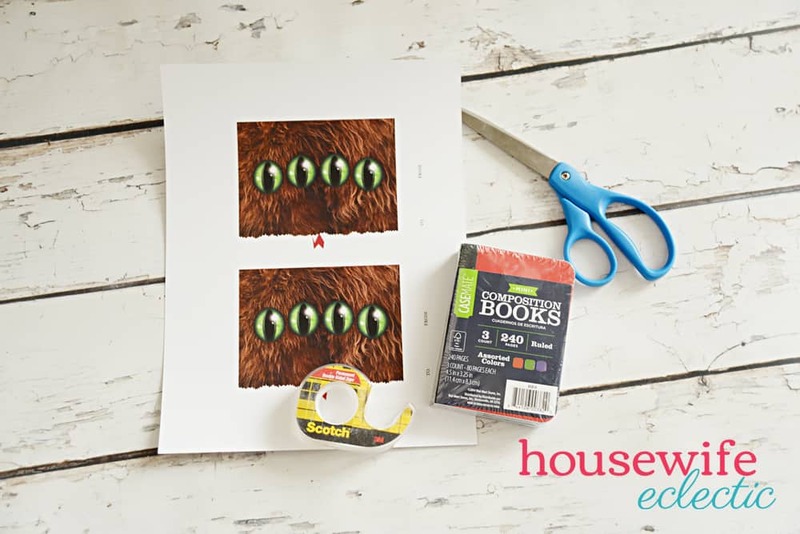 I didn’t just want it to look like the Monster book, I wanted it to be a little book that kids could write in too! We found these little composition notebooks and the idea came together perfectly! 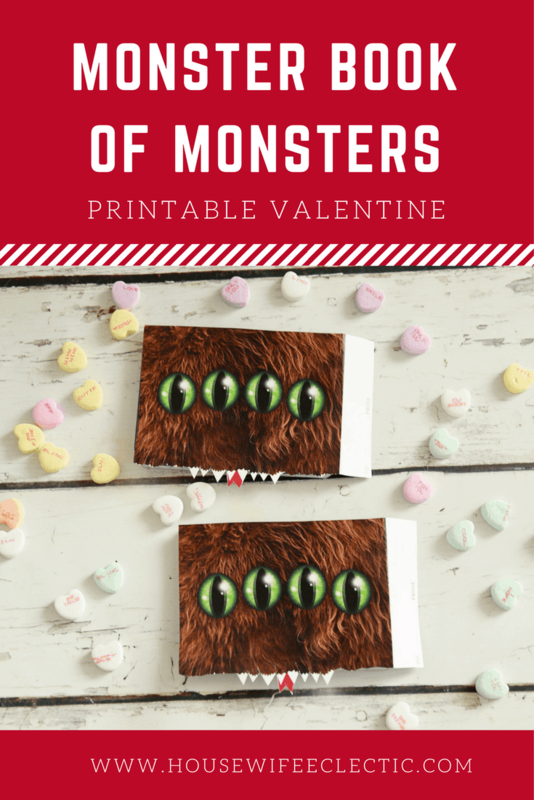 I love how this turned out, this Monster Book of Monsters Printable Valentine is probably my favorite printable we have ever made! Print out the Valentine at the bottom of the post on nice card stock. This will help the notebook last longer and look a little nicer. Address all of the valentines to their recipients. Cut out the printables, make sure to leave the to and from part attached to the valentine, this will hang over the edge of the valentine so the recipient can cut it off later. Make sure when you are cutting out to be careful around the teeth and the tongue. It is impossible to get every single piece of fur just right, so just do you best. Apply a piece of double sided to the back of the valentine and secure it to the top of the notebook. Make sure the to/from label is hanging over the edge of the notebook as you press the valentine down. 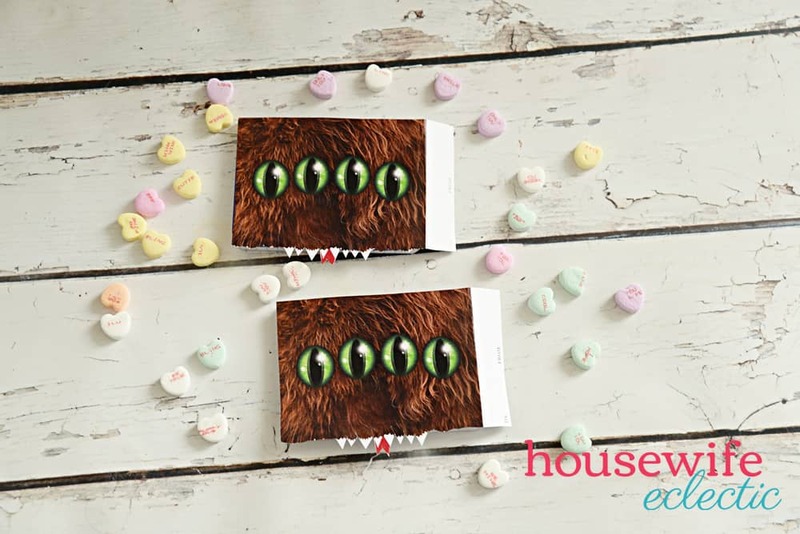 Hand this Monster Book of Monsters Printable Valentine out to all of your friends, but watch your fingers, they may bite! I subscribed and was only given the link to the Harry Potter Snitch printable. How do I access the Monster one? Thank you. What a cute idea. I have a grand child that is somewhat afraid of the monster book. Think they will still enjoy the valentine monster . That is super cute. My youngest is being super picky about valentines for school this year and I think he might like these ones! This is the cutest book! My daughter would love it. This is a great idea for classroom parties. These really cute! I was trying to find creative ideas that we can do for Valentine’s Day. It’s just not fun giving little store about cars when I can make something that the kids will like even more. Talk about a book that’s SUPER adorable. I think it’s really creative and it’s such a nice treat for the kids too. Definitely something that I’d do for my grand kids. These Valentine’s Day cards are very cute! I love Harry Potter, it’s one of my favorites things to read and watch. What a creative Valentines Day craft. This would be a perfect activity for preschool and school age kids. This is such a cute idea for Valentines. Love that it’s a book and kids love these little notebooks! Great idea! This is absolutely adorable! I would have never thought to makeover the cover like this. It is perfect for Valentine’s Day. Oh those are totally cute! My daughter would have loved to of passed those out in class. Now that is one monster book! I absolutely love it. What a fun idea for Harry Potter fans, I could see me having used this on books back when I was at school. Cute idea! 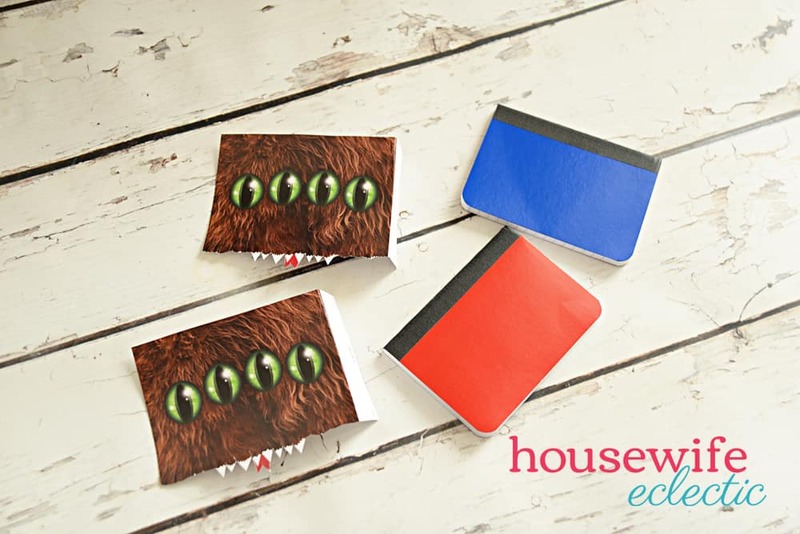 My kids would love the monster eyes on their notebooks. Not just good for Valentine’s day, but anytime. What an adorable craft. 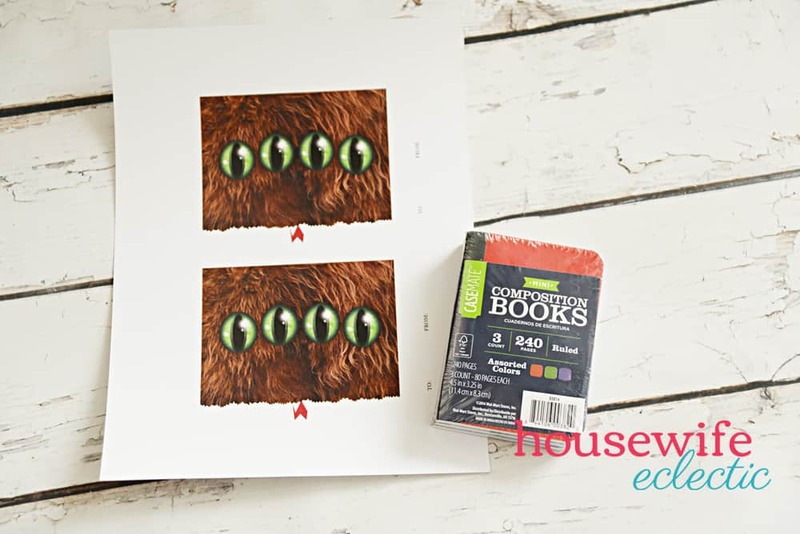 We have a book called “Love Monster” that we love to read around Valentine’s day so this craft would tie in perfectly. These are so cute! My daughter is really into crafts and drawing so she has a ton of notebooks. This would be fun to add to them. This is so unique. I would never have thought to have it as a theme for a Valentine’s gift. Anyway, I think kids would love it! Sending the link over to my sister. She is busy making Valentine’s gifts for her daughter’s classmates and friends. Such a really cute idea. I wish there’s car-related printables, that’s what my son is crazy about these days. Ohh this is so cool! I guess I need to share this to my cousins and for sure they will all subscribe and definitely go gaga over this. Haha! Just in time for Valentine’s day. Awe now that is a really cute idea! I really loved Goosebumps too.